This morning, we woke up to a beautiful blanket of snow. All the tree limbs, piles of wood and fields were covered. It was such a delightful transformation from the brown grass and mud that we've been plagued with for several weeks. Perhaps winter isn't quite done with us yet. I am actually okay with that, surprisingly. Because of the constant fluctuations between below freezing and 40 degree temperatures, I am still in the throes of deep winter cooking. So, soup graces our menu almost weekly. Anywhere between creamy soups to soup that is full of hearty beans and vegetables. I like to mix it up, depending on my mood when I menu plan Monday mornings. 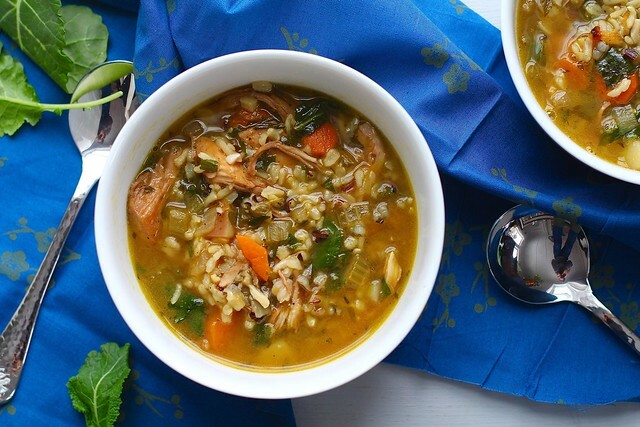 I would have to say, I think chicken and rice are one of my favorite soup combinations. Something about those two together make an exceptionally satisfying meal, and the ideal comfort food soup. I always walk away feeling full, happy and totally satisfied. 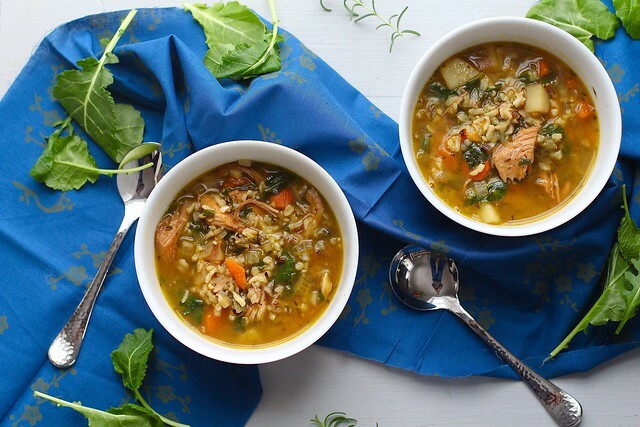 I know that I already have one chicken and rice soup on the blog, but I decided to make up my own version that is a little healthier and heartier. That is how this soup was born. 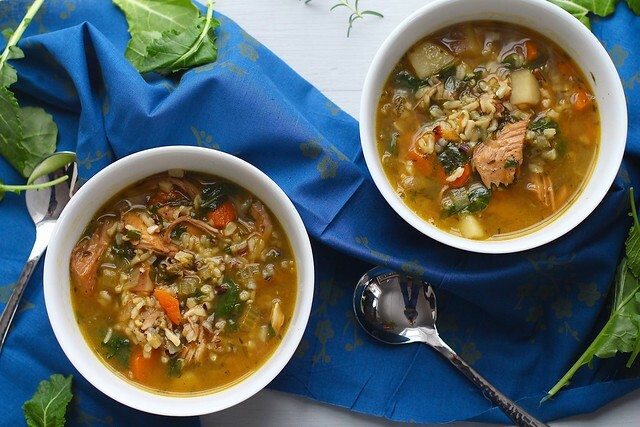 This soup is full of broiled chicken breasts, root vegetables, a little potato for the added heartiness, wild rice for the complex grains, and baby kale for the extra vitamin K and C (we all know we need those in the winter particularly!). Need I say anymore? 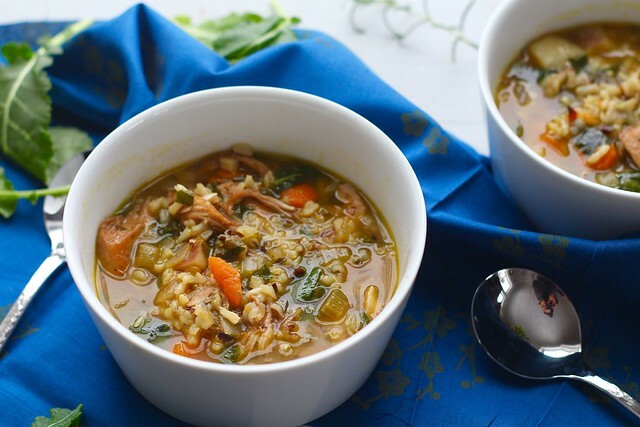 This is a soul-happy soup that will warm your chills on a cold winter day. Also, you can freeze leftovers if you don't want to eat it all at once. Serve this on a cold day with a big hunk of bread on the side, and all your issues of the day will melt away. Heat the broiler to high and place the rack 6 inches below it. Place the chicken on a foil-lined baking sheet. Place under the broiler, turning and rotating the chicken half way through, for about 20 minutes, or until cooked all the way through. Set aside to cool slightly. Shred the chicken once cooled and set aside. Meanwhile, place a large pot over medium-high heat and pour the oil. Once the oil is shimmering, stir in the carrots, onion, celery, salt and pepper. Cook, stirring frequently, until the vegetables are browned and softened, 8-10 minutes. Stir in the garlic and cook for 30 seconds. Stir in the wine, scraping up any browned bits on the bottom of the pot. Bring to a simmer and cook for 5 minutes. Stir in the broth, parsley and rosemary and bring to a boil. Stir in the rice, shredded chicken and potatoes. Bring to a boil again. Cover the pot, turn the heat down to low and gently simmer the soup for 40 minutes, or until the rice is tender. Stir in the kale until wilted. Taste and adjust seasonings if necessary. Serve hot.